These Instant Pot Pork Chops with Creamy Chive Sauce are one of my favorite go to meals for those those days that I flat out forgot to cook dinner and have five hungry (and impatient) kids to feed. They are quick to cook, easy to make, and absolutely delicious. I absolutely love meals that take less than 30 minutes to cook. For me, I would rather spend more time sitting at the dinner table talking with my family than standing in front of a stove. Maybe that’s why I love the Instant Pot so much…no standing in front of a stove required. Ha. Even better though are quick dinners that are also budget friendly. 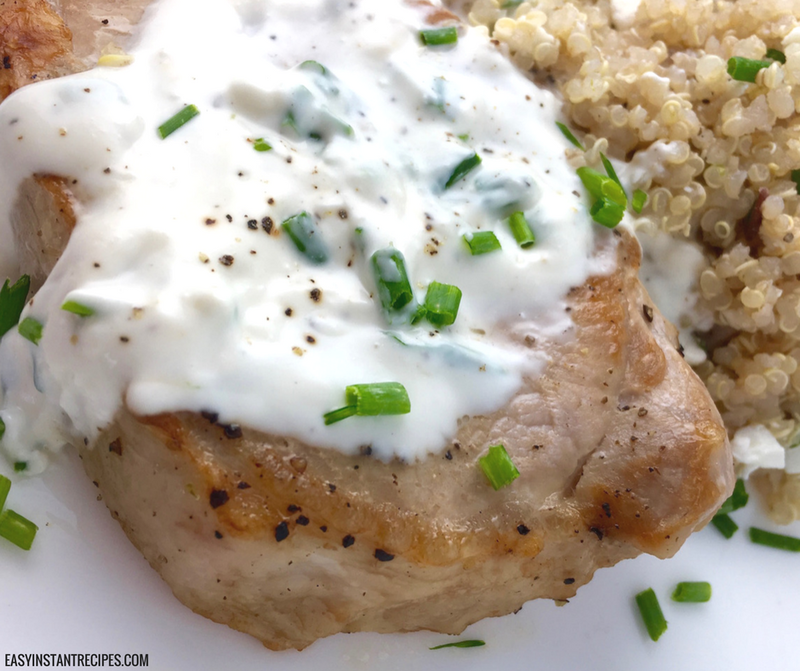 These boneless pork chops with creamy chive sauce are not only super easy to make, but they include only five main ingredients making it easy on the wallet too! One of the great things about these boneless pork chops is that they are covered in a super simple gravy that goes well with a bunch of different sides. Most nights when we makes these we throw cubed red potatoes into a steamer basket that sits on top of the pork chops in the pressure cooker. This dish also does well with couscous or quinoa (use stackable steamers for them or other smaller vegetables). Add chicken broth and cream cheese to the Instant Pot. Gently scrape bottom of pan to loosen brown bits and continue stirring until the cheese is completely melted, approximately 4-5 minutes. Not making these Instant Pot Boneless Pork Chops with Creamy Chive Sauce right this second? Then pin this post so you can easily find it later!